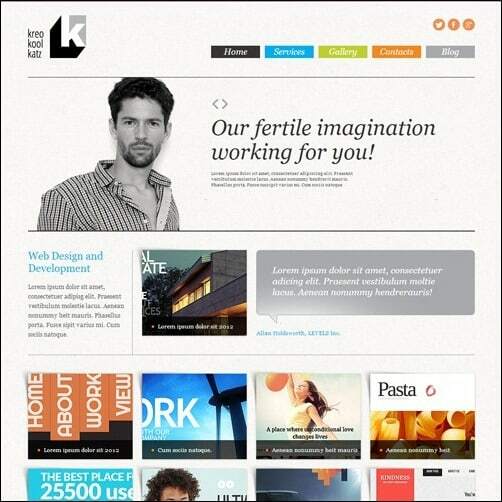 35+ Joomla 3 Templates – Want A Responsive Website? In this post, you will personally come to know more than 35 useful Joomla 3 templates. 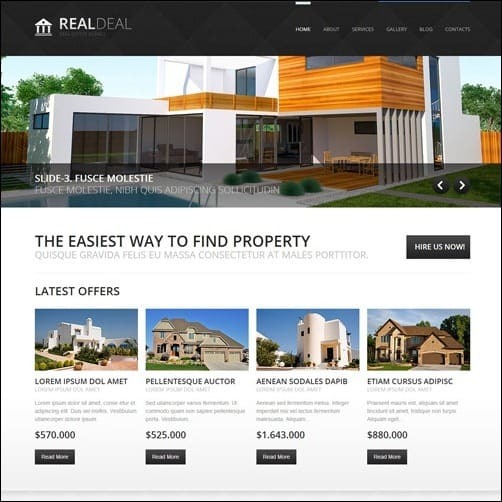 They will allow you to build beautiful and feature rich websites. You can choose from hundreds of awesome Joomla template designs, and you may find it hard to choose the wheat from the chaff. You may also be considering cons and pros on using Joomla 2.5 or Joomla 3.0. Experts advise you to build new Joomla websites with Joomla 3 because of the many improvements. On the other hand, if you want to upgrade your website from Joomla 2.5 experts advise you to wait for Joomla 3.5 unless you really need some of the Joomla 3 features. 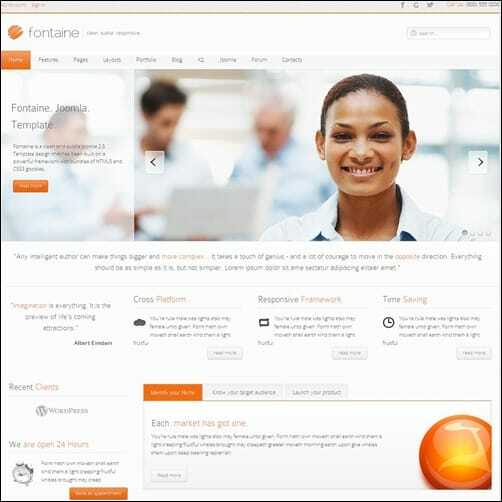 Joomla 3.0 has actually become quite attractive. It has some interesting improvements like being responsive and having an easy 3 step installation process. It also comes with a lot of goodies like the Bootstrap support and jQuery support. These features are very useful for extension developers. Let’s move on to the template showcase. I hope you find a perfect template for you next project. Please do not forget to share your thoughts on Joomla 3.0 templates with us, once you are done browsing on the list. 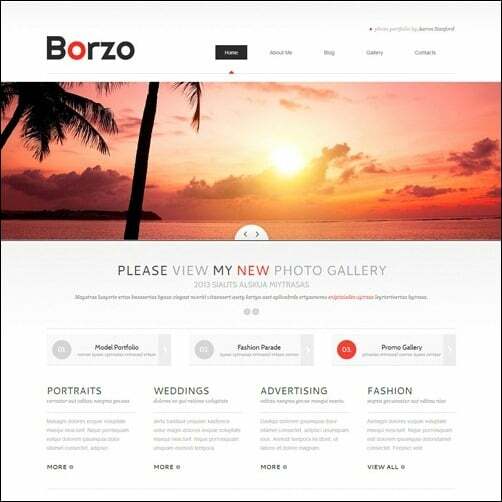 With this Joomla 3.1 template you will be able to create a professional business website with a clean layout and elegant look. It comes packed with lots of features, widgets and an intuitive admin option panel. KALLYAS is a responsive Joomla template with a clean and engaging design. The list of awesome features is overwhelming and you can customize this template easily for your needs. This template is a good choice for your news or magazine,blog website. It is a responsive / multipurpose template with a clean and minimalistic layout and packed with tons of features. 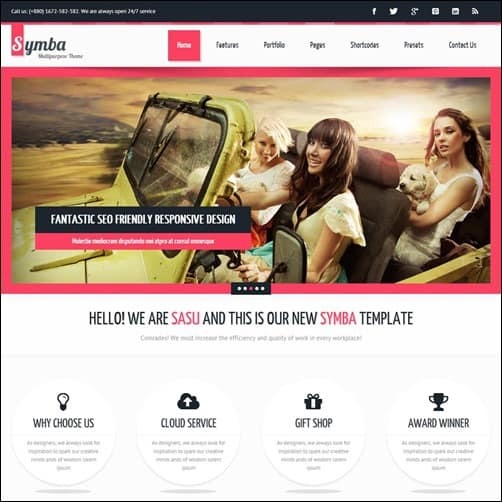 This Responsive Joomla template called SYMBA has a classic and unique look. It is a multipurpose template suitable for all kinds of websites such as Portfolio, Blog Site, Business Portfolio and more. 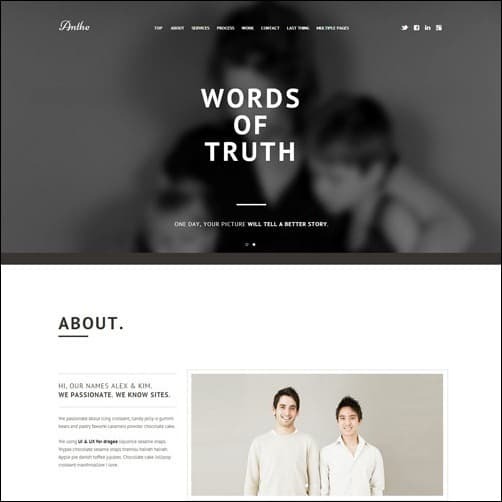 EKHO is a interesting template with a fullscreen layout and a modern look. It has tons of features and customization options. Anthe is a responsive Joomla Template that comes with an impressive one-page design for promoting agencies and creative people. The template comes with a strong package of useful features. 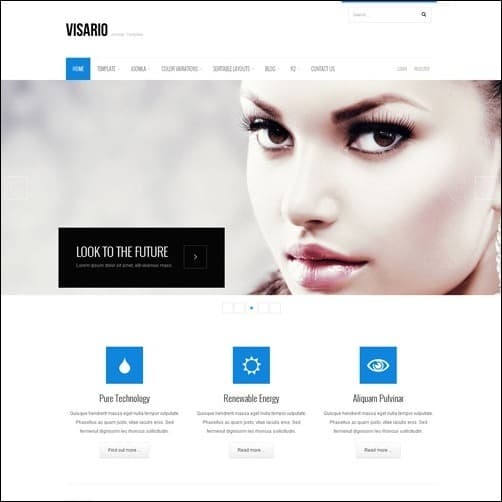 Visario is a responsive template for Joomla 3. It is a multipurpose template based on the Bootstrap Framework and the list of useful features is amazing! PurityFX is a feature-rich Joomla 3.x template with a stylish corporate design. It has a responsive layout and it comes with endless customization features like the various custom modules, unlimited color variations, two menu variations, Fullscreen and Boxed layouts and more. 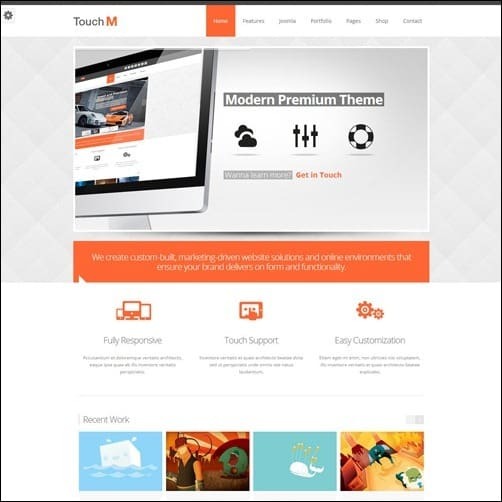 TouchM is a multipurpose Joomla Theme with responsive layout. It is perfect for business, product-based, and blog websites. The theme features a clean and minimal design, tons of customization options, 3 responsive sliders, filterable portfolio with various layouts, pricing tables and much more. 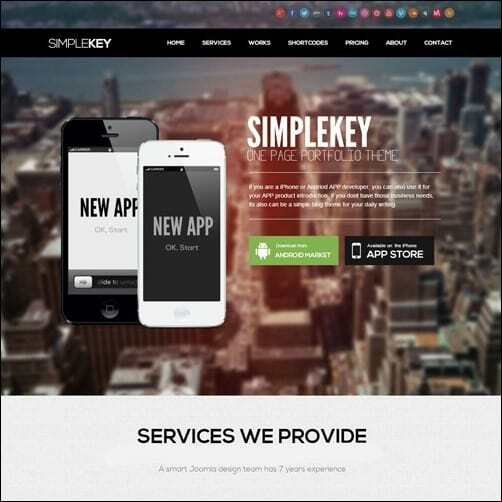 SimpleKey is a one page Joomla Template with multi-purpose features. The theme includes a lot of useful shortcodes and tons of other interesting features to help you build a powerful website. MyBrand is a clean and good looking Joomla template packed with cool features. It is a multipurpose and responsive template that will work wonders on you website. 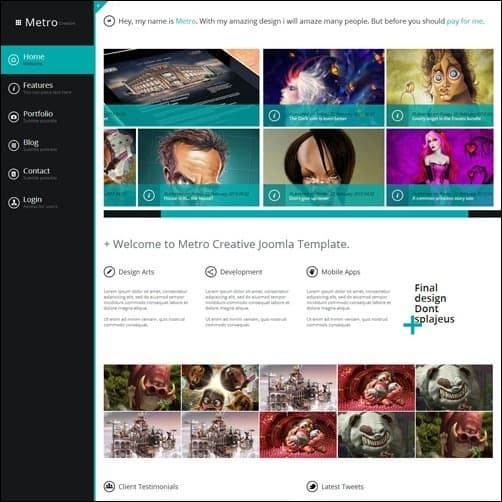 Metro Creative is a nice Joomla Template with a cool layout. It will work perfectly for most kinds of website: Portfolio, Blog, Corporate, Photography, and more. 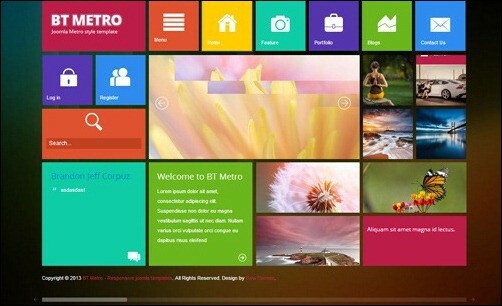 The Metro style inspired website are quite popular these days! 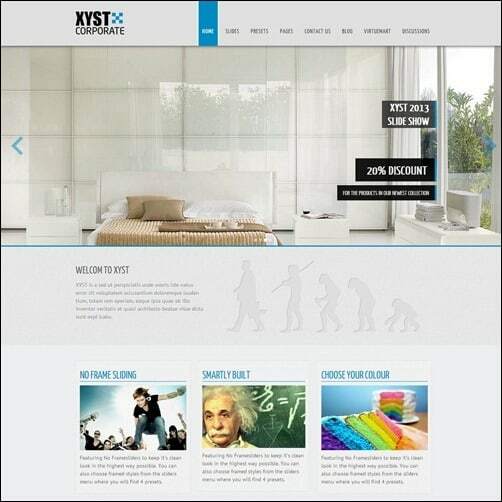 “XYST”” is a responsive Joomla 3.0 template with a corporate design. It is flexible and comes with a predefined suffix class or module class suffix. It is easy to customize and arrives with a lot of useful features. 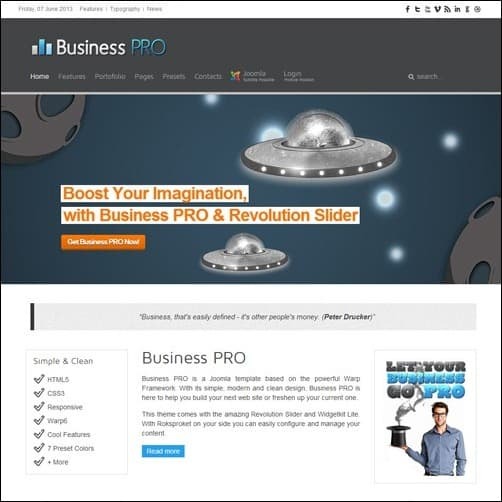 Business PRO is a clean multipurpose Joomla template with a responsive layout and tons of features! 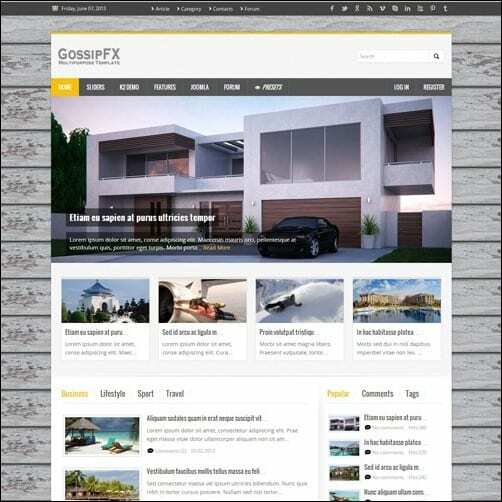 GossipFX is a stylish and feature-rich Joomla 3 template with responsive layout. 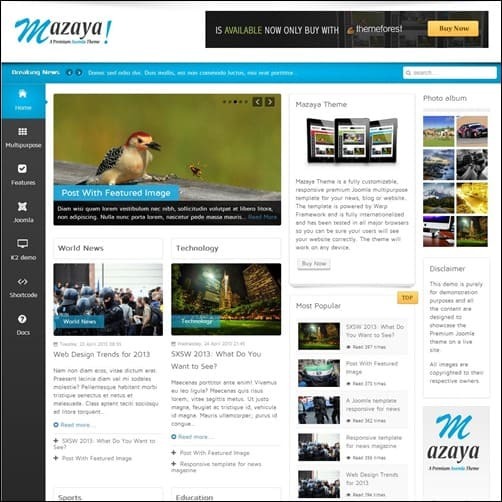 It has a lot of useful customization features and it comes with two homepage variations – Magazine and Business. 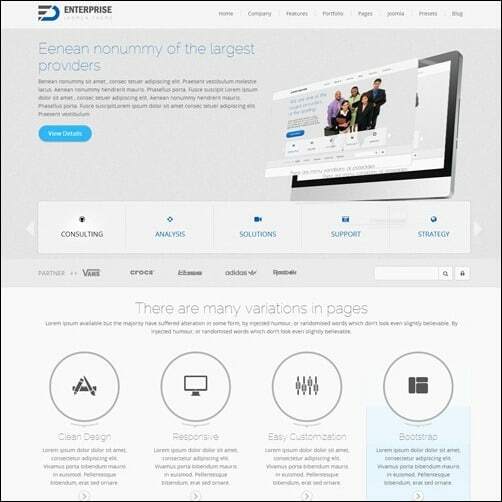 Enterprise is a clean business/portfolio style template for Joomla. 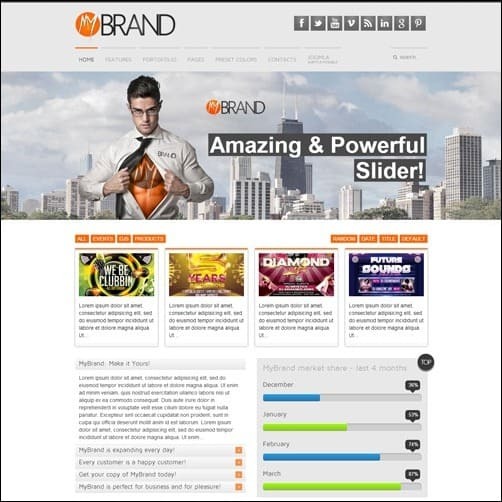 It has a flexible and responsive layout and it comes with an elegant corporate slider and pricing table feature. 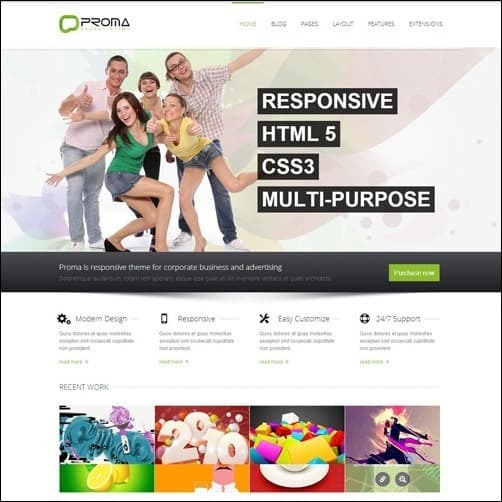 Proma is a Responsive Joomla Business Template. The Template has endless features and customization options. 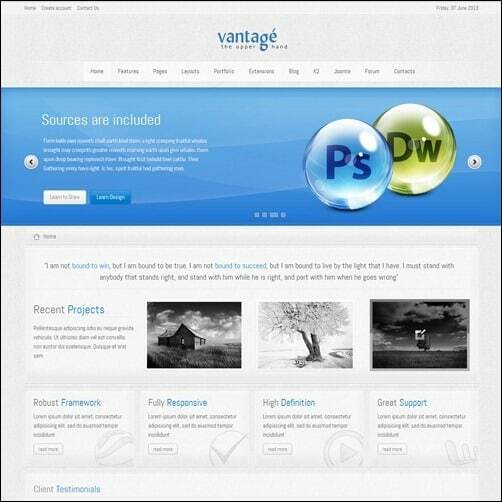 Vantage Joomla Theme is a clean business or portfolio Joomla 3.0 template. It comes packed with various extensions and an interactive admin option panel. 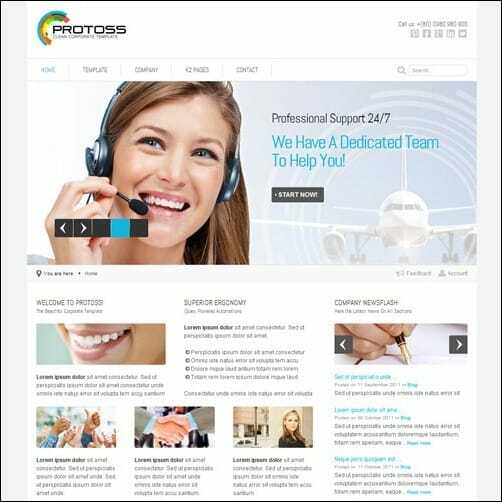 Protoss, a clean and beautiful template for Joomla! 3.0 featuring a fully responsive and retina ready design. Protoss also features DNP responsive Slider DNP responsive portfolio/media filter for Joomla! 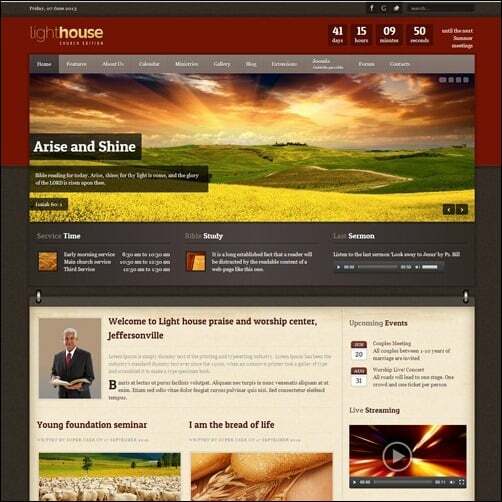 Lighthouse is an intuitive responsive Joomla 3.1 Template built with churches and non-profit organizations in mind. Lighthouse comes packed with various extensions and an interactive admin option panel. 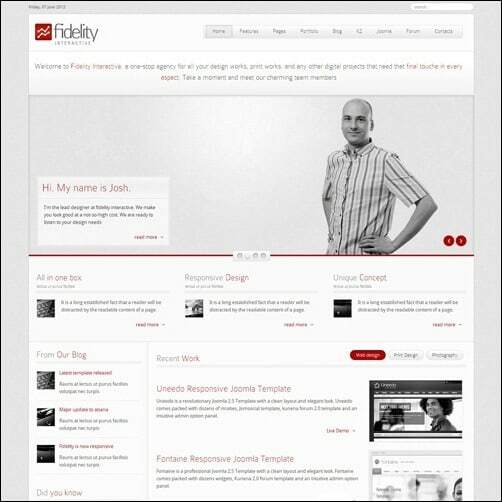 Fidelity is a clean and elegant responsive Joomla 3.0 Template built with business or portfolios in mind. Fidelity comes packed with dozens widgets and an intuitive admin option panel. 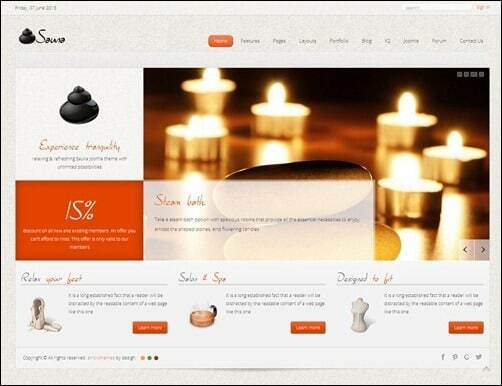 Sauna is a health and beauty Joomla 3.1 Template with a light and dark layout and subtle matte look. Sauna comes packed with dozens widgets and an intuitive admin option panel. Natural Beauty Template with 5 preset designs with Unlimited Color combination. 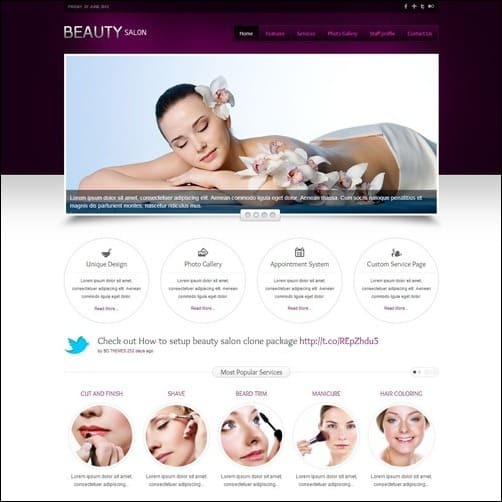 You can use this template for all kinds of website, but it is perfect for spa & beauty salons, massage and therapy website. Beautiful Joomla 3 template with responsive layout that will work perfect for clothing websites. 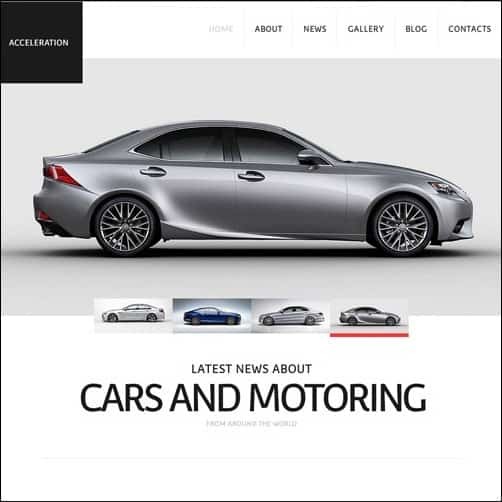 This responsive template is well suited for luxury car dealers with a stylish showcase and clean design. 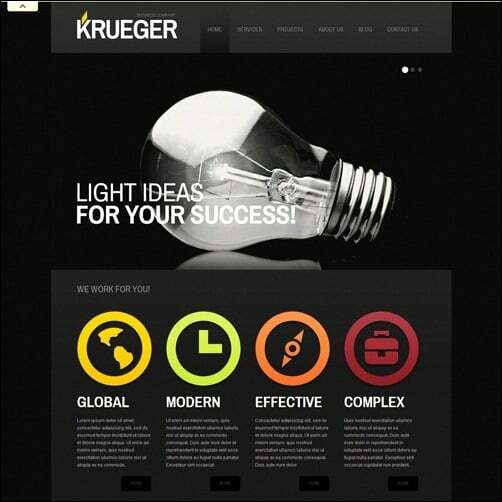 This responsive template uses black color background mixed with bright yellow, green and orange. The result of such blend you can see in the following design that looks bold and modern. The template features a slider and much more. This responsive template is perfect for a photographer’s portfolio. It has a clean design with modern vibe that will make people get interested in photographer’s work and the personality behind it. This responsive template is perfect for a creative portfolio. The layout reminds of the newspaper spread with large headings in the top, following with the blocks of information, cool images and links in the footer. 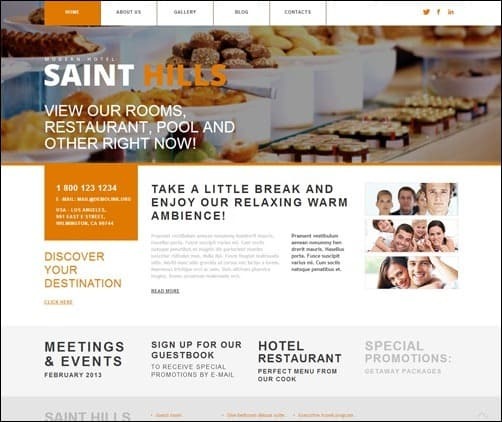 This responsive template is designed to make a perfect match for hotel / travel websites. 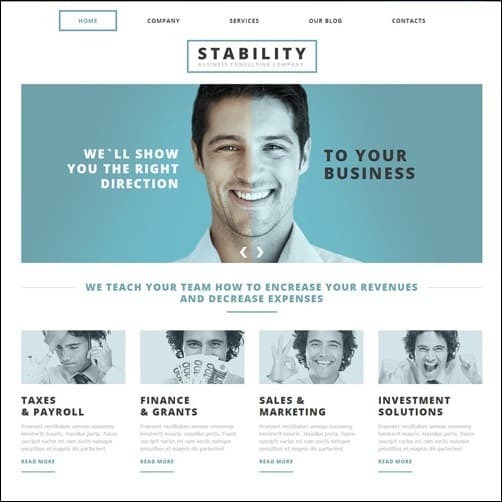 This is a clean and minimalistic template with responsive layout that will leave space for the content and help build trust. 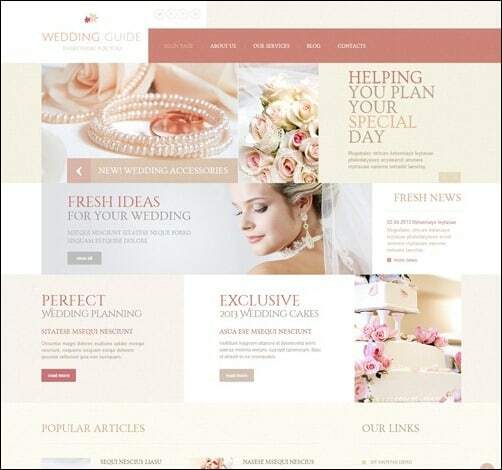 This is a delicate wedding theme with mosaics layout where multiple blocks of information are united into one content segment. You can have a nice showcase on the front page invites the visitors to see the wonderful photos. Blog page offers them to learn the site news. The theme shows a poetic tone that is a kind of melody for all people in love who plan their wedding. The design of this template is quite original and it is perfect for a photography portfolio. The prominent social media button would assist in promoting your best work. Moreover, the template is powered by Bootstrap, thus it carries a lot of useful features, for instance additional HTML elements, set of CSS components, grid system and much more. The great collection ever! Kallyas, Xyst, Tuchm, Ekho are the best. Like them very much. Kallyas is outstanding. Thanks to Hogash for doing the great job on kallyas. It was amazing..thanks a lot. 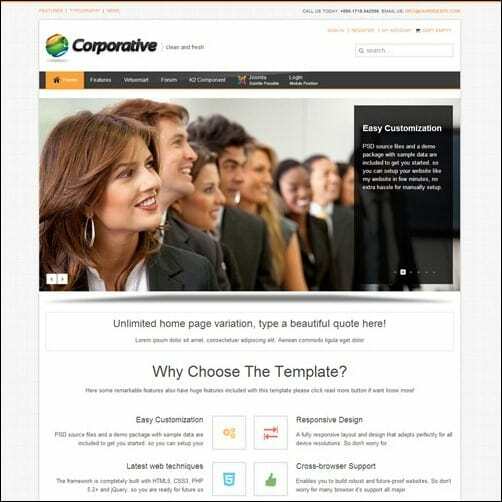 Really great templates for business users. Thank you.